Welsh weightlifter Darius Jokarzadeh says he is committed to fulfilling his dream of winning a gold medal at the Rio Olympics in 2016. The 21-year-old said he was considering a switch to American football after missing out on a Commonwealth Games medal in July. Jokarzadeh has been playing American football for Seton Hill University in Pennsylvania but wants to represent Great Britain in Brazil. "I'm committed for Rio," he said. "After experiencing Glasgow, being in front of the crowd and knowing that I could have got the gold, that's the big drive for me. "A gold in Rio [would be] a platform for me. It's a hell of an achievement." 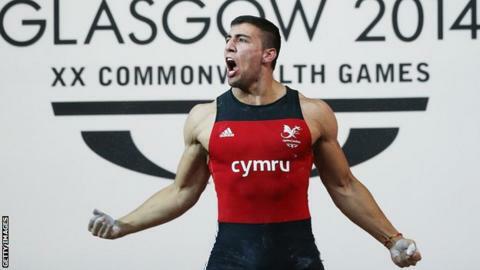 Jokarzadeh, from Cardiff, lifted a total of 361kg to finish fourth in the +105kg class at the Glasgow Commonwealth Games. But the 6ft 7in, 20-stone weightlifter admits the prospect of a big-money National Football League (NFL) contract in the US is a major attraction. "You hear about all the money and the fame that the guys have over there," said Jokarzadeh, who plays as a tackle when he is on the American football field. "That was really attractive to me, especially the financial side. Who can earn $10m dollars a year at something?" Allan Watson played four games as a kicker for the Pittsburgh Steelers in 1970. Jon Norris featured three times as a defensive lineman for the Chicago Bears in 1987. Rugby player Terry Price won the Triple Crown with Wales in 1965 before playing for Buffalo Bills in 1971. Rhys Lloyd played 48 games for the Carolina Panthers as a kicker between 2007 and 2010. He also played twice for the Baltimore Ravens. Jokarzadeh is now training for the American football combine in February, when NFL scouts look for new players at a week-long showcase event. "I don't think I'd go straight into starting for a team so it would be a year or two development contract," he said. "The minimum contract, I think, is $500,000 (£311,000) a year so you're not complaining." But Jokarzadeh says his American football ambitions will not get in the way of his preparations for the Rio Olympics. "I'll still do the combine but I'll let things fizzle out. I'm 100% committed for Rio," he said. "How many people can say that they're the strongest in the world? "It's something you will have for the rest of your life."